This is your preheader text. A short description of the newsletter. From cookouts to campouts, we’ll help you celebrate a fantastic Independence Day. Visit Revolutionary War forts for musket firings. Book a lakeside cabin to enjoy boating and swimming. Visit Jarrell Plantation to hear a reading of the Declaration of Independence, or fire up the grill at a shaded picnic shelter. You can even join guided hikes at Panola Mountain and Black Rock Mountain to watch community fireworks from a mountaintop. Find events, accommodations and activities for this weekend and Fourth of July. There’s nothing like a cool dip on a hot summer day. 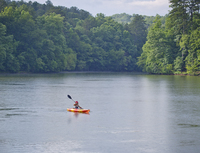 Check out the lakeside beaches at state parks such as Don Carter, Hard Labor Creek or Seminole. All have designated swimming areas and are free with $5 parking. Kid-friendly splash pads are located at Magnolia Springs, Little Ocmulgee and Gordonia-Alatamaha, and pools are available at F.D. Roosevelt, High Falls, Little Ocmulgee and Victoria Bryant (fee). “Soak It In” is the theme of many park programs this year, celebrating the ways we play in – and depend upon – water. Check out these tips on how to be water-safe too. Find a swimming spot near you. Break out your bicycle and stain-busting detergent. During July, we’re offering free membership to our Muddy Spokes Club, which includes a “mud-splattered” t-shirt. (While supplies last.) You’ll tackle 11 of the most scenic trails in the state. We’re also eliminating the trail fee for mountain biking. Plus, Cloudland Canyon State Park now offers 30 miles of mountain bike trails and bike rental, making it easy to connect with the Five Points Trail System in northwest Georgia. Load up on s’mores this summer because we have big savings for campers. Stay two nights during July and you’ll get a half-off coupon to come back in August. Our modern campgrounds offer a wide range of choices, from pull-through RV sites to more remote walk-in sites. Showers are just a short walk away. We even have paddle-in camping at High Falls and Reed Bingham. Learn more about the Georgia State Parks August Camping promotion. Join the soldiers at the fort for a day of artillery drills, musket firings, and soldier's life activities to honor Independence Day. Free watermelon and lemonade will be served. From 1721 until 1736, Fort King George was the southern outpost of the British Empire in North America. $4.50- $7.50 912-437-4770. Tuesday, July 4, 10 a.m. - 4 p.m.
Saturday, July 15, 9 a.m. - 1 p.m.
Local craftspeople will demonstrate a variety of 19th century skills such as blacksmithing, weaving, quilting, spinning wool, chair caning, blackpowder shooting and more. The mansion, outbuildings and museum will be open for self-guided tours. $5.50 - $6.50 706-695-2598. Saturday, July 22, 10 a.m. - 4 p.m.
Do you have little ones who love the outdoors? Do you want to teach them more about nature? Join us for this program designed for ages 3 to 5. 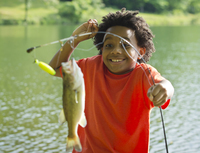 This month learn all about fish through games, art, stories and more. $5 plus $5 parking. 229-838-4706. Saturday, July 22, 10 a.m.
Fireflies and family time are just two good reasons to plan a camping adventure this summer. Plus, camping is an affordable vacation that’s close to home. This July, save 30% on campsites at General Coffee, Gordonia-Alatamaha, Laura S. Walker and Magnolia Springs state parks. Use promo code 30%OFFCAMP17.